Living in the age where the Internet of Things is revolutionizing our lives, the recent announcement by Google about the Physical Web and Eddystone support for Android is a big step in further bridging the gap between the physical and virtual worlds. The core premise of the Physical Web is to bring the power of the internet and web to interactions in the physical world. With the Physical Web, people would be able to walk up to any smart device be it a movie poster, a vending machine, a bus stop, a billboard or any other physical object and receive relevant content straight on their smartphones, without the need for downloading multiple apps. Hence, the Physical Web overcomes the challenges of app discovery and helps businesses to reach customers easily and effectively. The Physical Web has huge implications for businesses and we have discussed the pros, cons and the road ahead for the Physical Web in our earlier blog. In this post, we cover the working basics and some very interesting implementations of the Physical Web. Building a Physical Web project is not only easy, but is also cost effective. All you need is a BLE beacon which supports the Eddystone-URL format and a website. It is always advisable to first run a pilot project before going in for a full fledged deployment. Using Eddystone beacons, you can either create simple interactions by broadcasting the URL of a static webpage that contains static information that is relevant or create deeper, interesting interactions, where the URL points to a web app that uses advanced web technologies allowing for richer interactions. An easy solution that simplifies parking ticket payments can be done with the Physical Web. For this solution, the parking meter would need to provide internet access (through a radio antennae). Once this is done, the Eddystone beacon can point to a webpage, where the the meter’s ID number is encoded in the URL that is sent to the customer. The customer will then be able to open the webpage to pay the parking fees, either through a credit card or any other online payment solution. Hotels can easily improve their guest queuing system by leveraging the Physical Web. Once the guest arrives at the hotel’s lobby, the beacon can broadcast a URL that directs the guest to the hotel’s queueing web app. Guests can easily open the web app and join the digital queue and also get information with regards to the approximate wait time. This is an easy solution to reduce hotel operational costs as well. Smart bus stops that help passengers receive relevant bus schedules and notifications directly on their smartphones are one of the best examples of the Physical Web. The beacon placed at a bus stop can broadcast a URL that automatically directs you the web page where a dynamic web server automatically updates the website with real time bus schedules. This is also an excellent way to inform passengers about potential delays and traffic information. Malls and commercial complexes can also tap the power of the Physical Web. It is especially useful for retailers who aim to target customers who have not downloaded the retailer’s native app. The URL that the beacon broadcasts can also be used to prompt customers to download the app and additionally incentivize them for downloading the app. Eddystone beacons were used at the recently held CES 2016, where 1500 beacons were installed across the show floor in order to deliver indoor navigation among other services. The beacons broadcasted Physical Web URLs which directed attendees to the maps section of the CES app; in case the attendee did not have an app, they were directed to a web page, where they could easily download the app. Display boards, be it school notice boards, movie posters in a cinema hall or even digital signages at bus stops can all greatly benefit from Eddystone beacons and the Physical Web. A customer walking past a digital display can be prompted to open a URL which contains more information about the content in the display (a retail sale, for example). In an interesting example, Brookwood Middle School, in Vance, U.S. installed Eddystone beacons throughout the school, community, town hall and even a local restaurant in order to broadcast relevant information to students, parents and the community. For example, students and parents who would walk past the trophy case would receive smartphone notifications which directed them to a web page with relevant content such as videos, news and recent academic and sports accomplishments. Eddystone beacons installed at vending machines is a great example of how everyday objects can be made more interactive by the Physical Web. The beacon at the vending machine can be used to broadcast a URL that directs customers to a webpage containing details of the products in the vending machine along with purchase and payment options. Now, aren’t these interesting examples? The Physical Web is definitely a great way to leverage the power of the web to deliver simple, interactive and well curated experiences to customers and the community at large. You too can build your very own Physical Web project; all you need is an Eddystone beacon and a webpage. 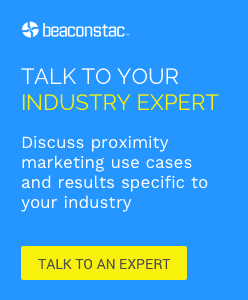 If you are planning an Eddystone beacon pilot, take a look at Beaconstac, that includes everything you need to kickstart your campaign in under 15 minutes. Using Beaconstac you can set up your own campaign, without a developer’s help! Do let us know how your pilot turned out; we would love to know the details.